This first month of summer in Copenhagen has been absolute fantastic. So warm and filled with sunshine. ..and a lot of ice-cream. And we're so lucky to have some lovely ice-cream shops in our new hood. Not that its any excuse, but we love ice-cream Walter and I. So we now and then go for a stroll and enjoy an ice-cream together. Some would think a little too often. I don't mind. We kind of named it our thing. As Holger is still too little and dad is too healthy thinking. I know its been a while since I shared an outfit on our journal. I've just been so busy with our new home, work and being a mother of two, but I wanted to share this. As it is one that I love for Walter this season. 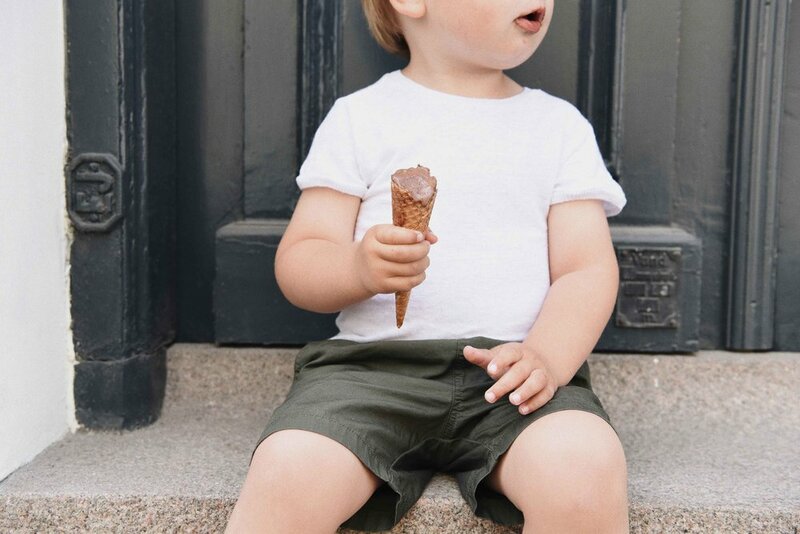 Walter is wearing a white linen t-shirt and lightweight cotton canvas khaki green shorts. A pair of cognac colored sandals with velcro. Added a pair of tortoise printed sunnies, which is not shown in the pictures. And of course added a chocolate ice-cream - his favorite! Nothing comes more perfect for this summer outfit, I think. Something new. I've added an alternative outfit to showcase pieces on or off budget. Happy midsummer and new week.